Wedding Wednesday: What will the kids wear? Hi all, we are back with another question for you about our wedding: what will the kids wear? We have three children between the two of us, two girls ages 13, 12 and our son age 4. Wedding Wednesday: Let's pick a dress. Welcome back to our wedding planning! We are so happy to have you read along as our big day approaches and really want you to help us make some decisions. This week, it’s the dress. As I mentioned before I am not all about the traditional approach, I want things to be fun, casual and creative. Wedding Wednesday: Let's pick a bouquet. So last week we announced that we are getting married, after four years of engagement, on September 1st of this year. We want you to help us make some of those fun decisions! This week we want to decide on a bouquet. So this is a week late due in part to my inability to find time to edit photos, but we wanted to acknowledge our son’s 4th birthday, on May 6th. Here he is blowing out his candles like a pro. More to come later in the month with full party details on his Nerf Elite birthday party. We had a blast! If you’ve been reading our blog for a while you know that Jason and I are partners in this crazy party world, but what you might not know is that we have also been engaged for quite some time as well. Four years in fact. Well we are finally going to do something about that this year, on September 1. Have you ever wanted to create Glowing Easter Egg Jewels? Me either. I did it by accident. Today, during a little intermission from a DIY photo shoot, I had an idea. We were working with some really cool plastic Easter eggs that are faceted, instead of the usual smooth eggs. These eggs are pretty cool on their own, but I had the urge to photograph them in a unique way. So I held them up to the sun, completely blocking my view of it with the egg, and snapped a picture. The result is pictured, with some minor contrast bumping in Lightroom after the photos were taken. We just wanted to take a moment at the end of this spectacular year to wish you all a very Happy New Year! See you all on the flip-side! For the third year, DailyCandy is helping launch small businesses into the big time by giving them coveted publicity and one-on-one mentorship. Small businesses everywhere have entered; out of all the entries, we were chosen to be one of 18 finalists. Now it’s your turn to pick the winners. We hope that you will take the time to vote for us! Who deserves to go big? Vote for one in each category —and vote every day. Be automatically entered for a chance to win a Jonathan Adler tote and $250 in DailyCandy Deals credit. Have a Sparkling 4th of July! Not so long ago I read an article regarding the merits of showing oneself as is. Meaning, not just the good and awesome, but the not so good and awesome as well. The point of this particular blog post was to illustrate how far bloggers go these days to make everything look perfect. We here at Hello My Sweet are guilty of this. Jason and I try really hard to make our photos look perfect for when they hit the blog. So hard in fact, that when I realized that something has gone very wrong recently, I procrastinated the photo editing process for a long time, just so I didn’t have to be smacked in the face with my error. Putting this party off for as long as possible, was a subconcious effort however, and only after Jason asked me, “Are you unhappy with the way the party turned out? Why haven’t you edited the photos for it yet? You usually do not wait so long” did I realize what I was doing. The poor man was feeling like he had messed up, because I hadn’t yet done my job. The part where I stare at the photos I have taken (over exposed, underexposed, blurry, you name it) and try to make them perfect in photoshop and ready for our blog. You see folks, my error came in the cupcake decorating process this time. We made Milky Way cupcakes for a Retro Rockets & Rayguns space themed dessert table. Milky Way cupcakes consist of chocolate cake, with a milky way candy baked inside and topped with whipped chocolate buttercream and caramel drizzle. Sounds good right? Well leave it to me to make the delicious into the opposite. I baked the cupcakes, let them cool and commenced to decorating them with the buttercream. Everything was going according to plan, we were right on schedule. Only it wasn’t going well at all and I didn’t even realize it. I had chosen a wide round piping tip for the buttercream frosting process. I chose this because I wanted to keep it simple. This of course resulted in a fat swirl of chocolate buttercream. See where I’m going with this? Well I didn’t see it. So this is just my little confessional today. I know I am not perfect. And most of you probably know it too. But in case you were in the mindset today of, “does this kind of stuff only happen to me?” I’m here to tell you, “Heck NO!” It happens to me too. And Jason. And everyone else. I bet even Amy Atlas has had her fair share of uh-oh moments. Never use a round tip to pipe chocolate frosting onto a cupcake. EVER. So tell us, what was your funniest baking or decorating disaster? We’d love to hear it; leave us a comment up top! Our son Desmond enjoying some watermelon today. Happy Memorial Day to you all and a special thank you to those who service and sacrifice we honor. For the second year in a row there is a new movement in Holiday Shopping. No, it is not the ever more popular "open on Thanksgiving night to attract even more buyers" ploy of corporate retail chains across the country. This movement is different. This inititative is the Shop Small Business day, planned for Saturday November 26th, 2011. It is sponsored by American Express and encourages shoppers everywhere to participate by buying their holiday gifts at small business retailers. This could be the shop around the corner on Main Street USA or an online shop presence on the ever growing website Etsy.com. Being a small business ourselves on Etsy, we are totally into this effort. In fact, if you like on Facebook or follow us on Twitter you may already have an inkling as to how popular we feel this movement should be. So in light of all this we felt we should kickstart things a bit with a little Etsy Gift Guide we put together. 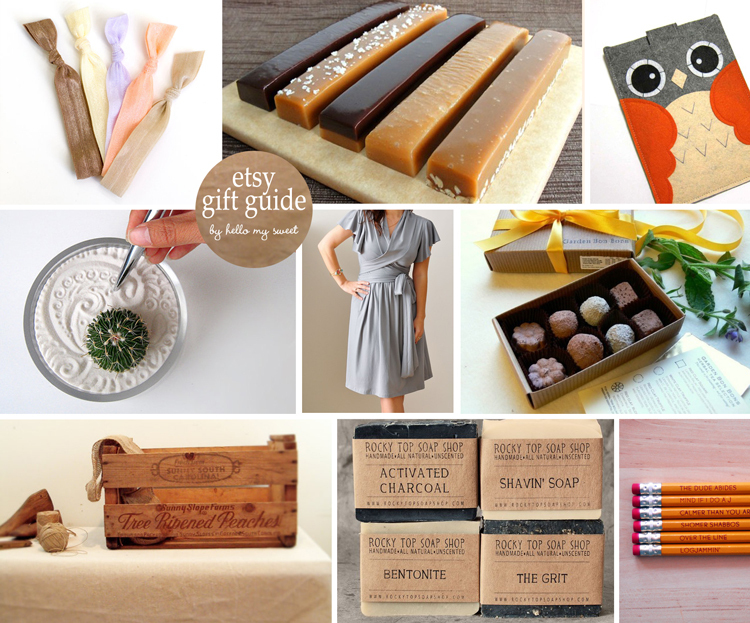 After browsing their website we came up with a nice list of gifts that are affordable, handmade or vintage, and easy to purchase, while supporting small business all at the same time. 1. The Blonde Package - 5 Elastic Solid Color Hair Ties that Double as Bracelets from Mane Message This one is for the lady who keeps a hair tie on her wrist just in case of hair emergency. 2. Caramel of the Month Club 12 Months from Have It Sweet For the gourmet sweets connoisseur. 4. Mini Cactus from Lost In Zen Perfect for a co-worker or boss, help keep that office Zen feeling going strong all day and decorate the desk to boot! 5. Light Grey Wrap Dress With Short Ruffled Sleeves And Shirred Skirt from Lirola This one is for you, or your sister or your BFF so they will always have something simple, comfortable and stylish to wear! 6. Garden Bon Bons - Herbal Tea Selection from Garden Bon Bons This is for the gardener and tea drinker in your life, she can grow it and then steep it. 7. Circa 1950s Vintage Crate from GoSeek For the collector, a vintage item to treasure. 8. Manly Man Soap Set - Natural Soap - Handmade Soap - Unscented Soap - Mens Gift Set from Rocky Top Soap Shop For the gentleman, father, brother or hubby, something to pamper himself proudly! 9. The Big Lebowski (Yellow) - Pencil Set from OneUpDesigns For the cult classic movie buff, a simple and hilarious gesture to stuff the stocking. We hope you will enjoy browsing Etsy just as much as we do! Use the coupon code SHOPSMALL2011 to receive 20% anything in our Etsy shop on Saturday Nov.26th!